Young readers can visit some fascinating spots in a number of visually intriguing titles. 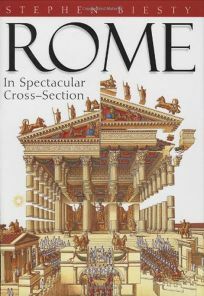 Stephen Biesty employs his meticulous drawings in an oversize volume to survey Rome: In Spectacular Cross-Section, with text by Andrew Solway. Biesty's artwork, packed with minute details, uncovers the inside workings and activities at various key locations such as the Colosseum and the Baths of Trajan, as a Roman senator and his son make their way around town. Text and illustrations combine the extraordinary and the everyday to provide a wealth of information on ancient life; explanatory captions supply historical facts and lore. .